It’s always such a joy to be asked to speak at conferences, and thrilled that our old friend Jonathan Allen (Former Search Engine Watch editor) asked me to come to his inaugural EQ Leadership Labs event in St. Louis, Union Station, next week. 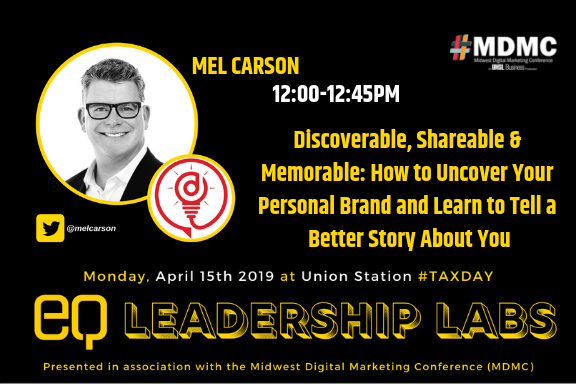 I’ll be speaking about the importance of entrepreneurs to have tip-top personal brands as leaders and sharing tips on how they can have their wisdom and experience be more discoverable, shareable, and memorable. If you are in the area, please drop by – you can register with this discount code – and looking forward to seeing and hearing from some other past industry friends and peers like Mike Grehan, Simon Hestletine, and Thom Craver. Should be a marvelous event! Don’t forget to: subscribe to The Personal Brand Lab, follow @Delightful on Twitter, like the Delightful Facebook Page, and join us on LinkedIn.